Got mine 10 mins ago on Test server.I parked my 78 DRU in DN to check Vaniki spawn.4 days no luck but after the patch today,finally got Vaniki spawned,and its not just a normal Vaniki,its FABLED Vaniki. Not too many infos about this rat.In today's standard,even caster can tank it no problem.Max hit on 83 SK is 1234,it flurry too.Spend lots of time on casting and tried Gating at low HP. Drop 2 Willsapper(one fabled,one normal) and some quest items. Last year I camped this thing for about two weeks solo, before I decided that it was just broken. This year, I spent 4 weeks in zone from the minute fableds went live, working with a team of 3 players. Between us, we covered the zone with trackers nearly 24 hours a day. Today, approximately 6 hours after a patch, he finally spawned on the Tribunal near Vilefang. I don't believe that the patch fixed it, since I actually petitioned last year, and was told it was working normally, but I do find it interesting that we both got it on a patch day. Forgotten Nemesis and our guests on FV server walked in DN today. No one there. 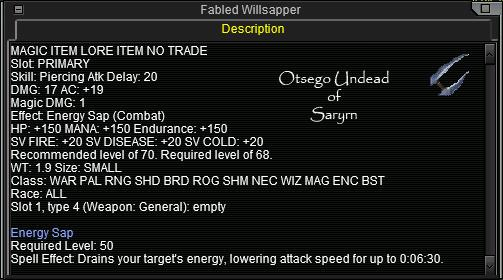 so we got ourselves a fabled willsapper. Killed all the Fabled mobs numerous times (expect Zlan of course), spent a looong time non stop in this zone 24 hrs a day, we actually took shifts on the camp. I am near exhaustion and no Fabled Vaniki has spawned. GF is gone, I am totally tired, this camp succors.